Photo: Abey Torrez, Dr. Stephen Gomez (Faculty member in Sustainable Technologies), Jeremiah Star, Luke Spangenburg (Director of Biofuels, Center of Excellence, Training Center Corporation) and Jonathan Schwilling; the other graduate Martin Lynch is not pictured. 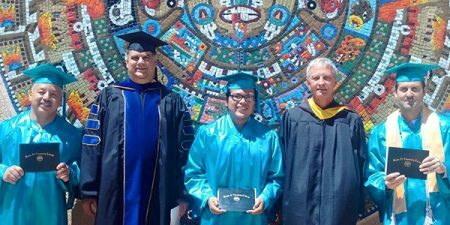 Four students were the first to receive the new Algae Cultivation Certificate during the spring commencement ceremony earlier this month. The Certificate in Algae Cultivation counts toward the Associate in Applied Science in Controlled Environment Agriculture. Algal production provides a sustainable source of biomass for bio-based products, soil remediation, animal and fish feed, fuel and foods. This Web-blended program provides applied theory with hands-on training. The certificate is supported by the Algae Technology Education Consortium (ATEC). Abey Torrez will continue teaching controlled environment agriculture and algae classes at SFCC. Jeremiah Star is teaching sustainability classes at the Indian School high school in Santa Fe and will continue his studies at UNM. Jonathan Schwilling is continuing his studies at UNM. Martin Lynch will continue his studies and join the algae research team at NMSU after completing a summer internship at the National Renewable Energy Lab in Colorado.